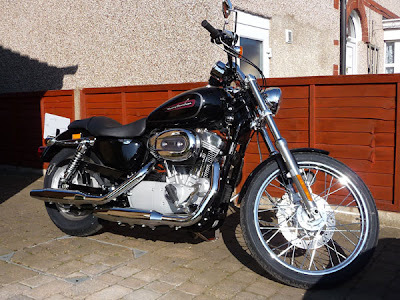 Sometimes an object is so beautiful it takes the wind out your pipes - and when your own pipes are being overshadowed by the glittering beasts on this new Harley XL883C Custom Sportster, that's not an insignificant event. 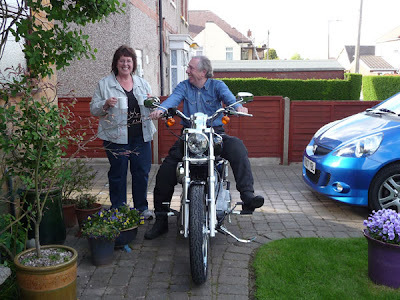 This is my Dad, John (that's Mum bringing out the tea) and this is his new bike. 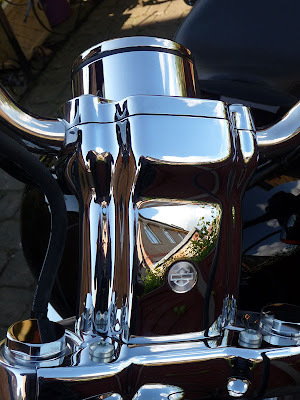 In Vivid Black and chrome, this diminutive beauty was already making far too much noise when it arrived at my door, Father astride it with newly-blacked boots and head-to-toe in leather. 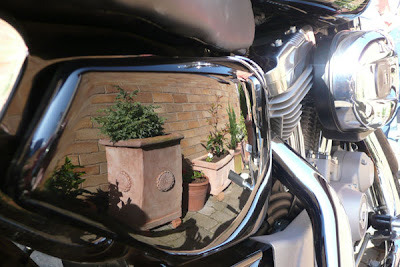 'Oh yes', I agreed, as he pointed at the exhaust pipes in that unique muffled 'helmet-on' language only bikers understand; 'it is a bit noisy isn't it? Be better when you get the quiet ones fitted'. A black leather finger wagged in my face. 'No,' said the helmet. 'These are going. 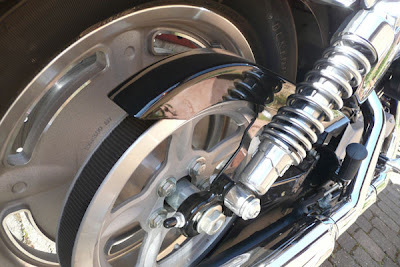 I'm getting the loud ones fitted tomorrow'. And he did. And they are loud. And the bike goes, according to Dad, just as he expected - like a great big joyful bag of bricks with a totally impractical pillion seat. He normally rides a fast and gargantuan Suzuki V-Strom in flame red, which looks after the little American cousin in the newly-tidied garage (anything from the Land of the Rising Sun is apparently always going to be genetically superior). 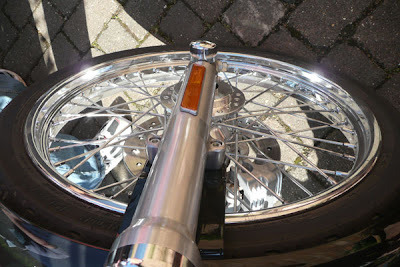 But here is the bike, and here are its breathtaking curves and details.